You may know that I have a Ph.D. in English from Duke University. Translation: I know the rules of grammar. Don't get me wrong. I've never taught grammar, and I sometimes break the rules myself. Not by mistake, though. Deliberately, when doing so helps me communicate more effectively. I was taught how to do this. I am licensed to break the rules. 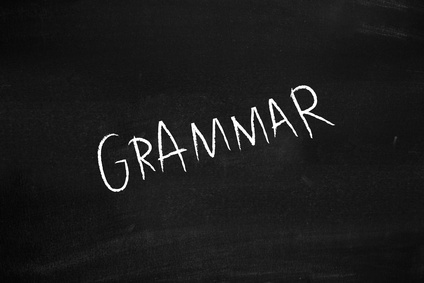 But there's a particular point of grammar that people get wrong so often that I almost never hear people get it right. Even media spokespeople who ought to know better. It's gross. If someone said to you, "Me appreciate what people say..." what would you think? I'm pretty sure you'd think the person was illiterate, wouldn't you? It's such a glaring grammar error that you almost never hear it. Of course, the proper way to say this is, "I appreciate what people say...."
Because when the first person is the subject of the verb, you use the pronoun "I." I appreciate. Not me appreciate. When the first person is the object of the verb. you use the pronoun "me." For example, "People appreciate me...." To indicate who people appreciate, you'd never say, "People appreciate I." "I" > VERB > "me"
So far so good. This rule is so obvious that you almost never hear this mistake. But when when referring to more than one person, most people get it wrong. For example, I recently watched a video in which an expert in marketing said, "Me and Dean appreciate what people say..." He wasn't accidentally misspeaking. He said it three times. This is incorrect. You wouldn't say, "Me appreciate..." so you wouldn't say "Me and Dean appreciate..." or "Dean and me appreciate..." The pronoun me is always used as the object, not the subject. The correct way of saying this is "Dean and I appreciate..."
But the grammar error that bugs me the most is also the most common. People everywhere will say, "He was always kind to Jill and I." This is incorrect because the subject pronoun "I" is used as the object of the preposition "to." The first person pronoun for an object is "me." It's incorrect to say "kind to I," and so it's incorrect to say "kind to Jill and I." The correct way to say this sentence is, "He was always kind to Jill and me." This isn't a judgment call. This has always been the rule, and it still is. Any magazine or book editor knows the difference and will make the correction every time. And yet, I hear this mistake all the time, even by professionals in broadcasting. It's as if their grammar teachers all taught them the wrong rule. They think that if you refer to yourself along with another person, you have to always use the pronoun "I." Use "Jill and I" if the two of you are the subject of the verb. Example, "Jill and I never go to the movies anymore." Use "Jill and me" if the two of you are the object of a verb or preposition. Correct grammar: "To Jill and me, movies are too expensive." Or, "When you find a movie worth seeing, tell Jill and me." Not tell I. Not tell Jill and I. Tell me. Tell Jill and me. INCORRECT - "The comment embarrassed he and his friend." You wouldn't say, "The comment embarrased he." You'd say, "The comment embarrassed him." So the CORRECT usage is - "The comment embarrassed his friend and him." You've been informed, as clearly as I can explain it. If you persist in making this gross mistake, I don't care how many celebrities grin in front of the camera and say it wrong, don't make this mistake in my presence, or I guarantee you I'll think you're illiterate. You can trust me on this one. I'm a doctor. Good job, Denny! Thank you for the lesson. Even your fellow English major needs a reminder now and again. If a rule so difficult to follow that everyone makes the same mistake, there might be something wrong with the rule, or with the brain's way of encoding plural things. And it's kind of abitrary...someone learning English as a second language would probably never notice the difference. It's not like a programming language where the lack of consistency actually breaks anything. Thanks Denny, this is an error that also really bugs my wife and I. Oops, my wife and me! (just wanted to see if you were paying attention). And I hear it ALL of the time, and everywhere EXCEPT when I travel overseas. I like this article: the bluntness and yet playful side to it. I'm not a Ph.D in English, but I took it very seriously alongside my studying chemical engineering in the university. Today, the result is there's a few of us that speak real well. I find that language, any at all, more especially the richest of all, English, reveals a great deal whenever well-spoken, formally or colloquially. All in all, I find this sumptuous. Remove the other person from the sentence and say it. Example: Dean and me went to the store. Remove Dean. Me went to the store. Nope...doesn't sound right. I went to the store. Yep. Dean and I went to the store. "When you find a movie worth seeing, tell Jill and I." Remove Jill from the sentence. When you find a movie worth seeing, tell I. That doesn't sound correct. So, the word should be 'me'. When you find a movie worth seeing, tell Jill and me. I find this simple trick works every time. Just removed the other person and you'll have the correct 'I' or 'me' every time. Michael, that is a great tip. I do that myself, and it works great. It IS a simple way to remember to say it right, and I highly recommend it. Do it enough times, and it will become automatic. Isn't it true that the actors who do it are following a script? What you say is obvious. Newsreaders and others don't, I think, get it wrong anywhere near as frequently as you suggest. Pedant without a cause?